Sometimes, NLL schedules can be brutal. Last night, the Colorado Mammoth snuck away with a one-goal victory over the Georgia Swarm at the Infinite Energy Area. The game finished up at 9:51pm Eastern Time. The Mammoth were out of the arena by 11:00pm and back at their hotel soon after. Early the next morning, they boarded a flight to Denver and touched-down in the Mile-High City at 8:45am this morning. Two hours later, they reported to the Pepsi Center ready to do it all over again. The point is, in a sport as rough on the body as lacrosse, back-to-back weekends are brutal to say the least. Yet, the Mammoth showed no signs of fatigue in today’s contest. Buffalo got on the scoreboard first tonight as Josh Byrne netted his only goal of the game. Soon after, Joey Cupido answered for the Mammoth to tie the game at one goal apiece. After a seven minute scoring drought, Buffalo took the lead once again off of Dhane Smith’s first of three goals on the night. The second quarter proved to be a Mammoth beat down. Led by defensemen Robert Hope and Taylor Stuart, Colorado held Buffalo scoreless for a full fifteen minutes. During that same time period, the Mammoth found the back of the net four times with Chris Wardle scoring two of them. Jacob Ruest got the scoring started for Colorado 56 seconds into the third quarter. Buffalo ended an eighteen-minute scoring drought and created a 6-4 ballgame by putting two goals past Colorado’s Steve Fryer midway through the third. However, Colorado responded with two goals of their own courtesy of Ryan Benesch and Zach Greer. Everything was on the right track for the Mammoth heading into the final period. The Mammoth had found a nice rhythm and seemed to be coasting to an easy victory. But what’s life without a little excitement, right? Colorado didn’t find the scoreboard a single time in the final quarter. A few small defensive miscues saw the Mammoth’s lead cut down from four to three. Then to two. Then to one. Thankfully for Colorado, Buffalo just couldn’t find the back of the net for the rest of the night. After a bit of confusion with the clock to end the game, the Mammoth slipped past the Bandits by a score of 8 to 7. For the second night in a row, the Mammoth were able to come up with a big win in a close game. Robert Hope recorded his 400th ground ball tonight while Joey Cupido notched his 98th career point. Overall, Colorado played well. It was refreshing to see a Mammoth team working so efficiently offensively and locking down everything that came their way on defense. Between the pipes, Colorado found out that they have a solid backup goalie in Steve Fryer. The new guy recorded 45 saves on 52 shots and was able to record a shutout in the second quarter. Additionally, the Mammoth can be proud of their shot selection tonight, as only 27 shots did not find the goal. Unfortunately, Colorado’s woes at the faceoff circle continued tonight as the Mammoth went 6-19 in that category. With the win, Colorado improves to 7-3 on the season and remains in second place in the Western Division. 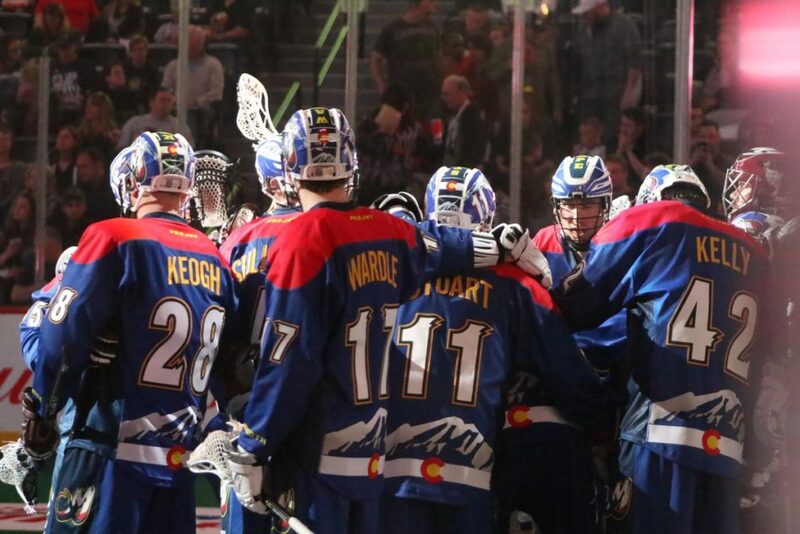 The Mammoth will be back in action next week on Saturday, March 10th when the Calgary Roughnecks visit the Pepsi Center for Military Appreciation Night. Faceoff is set for 7:00pm. Also, note that in three weeks, John Grant Junior will have his No. 24 jersey retired and raised to the rafters. That game will take place on March 24th at 7:30pm.